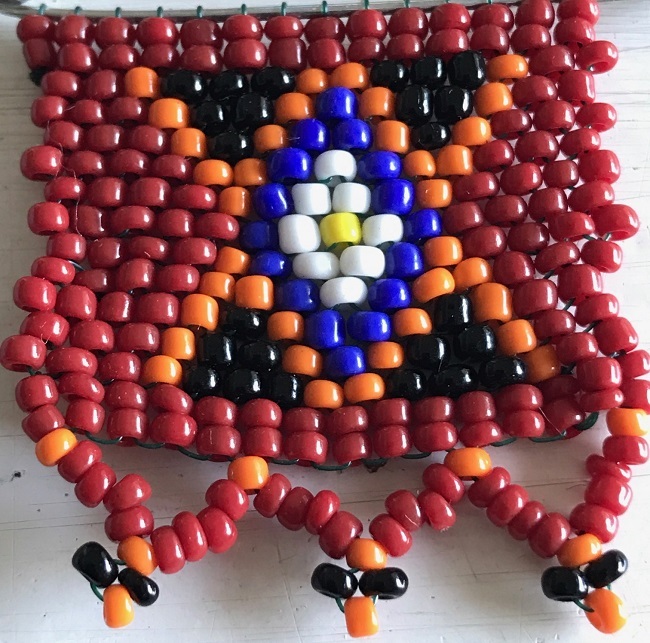 Many years ago, before writing letters and cell phones, the Zulu women in South Africa used colour and beading to express feelings and communicate messages regarding gender and marital status. Last week I visited DumaZulu, South Africa’s biggest cultural village situated in the heart of Zululand close to Hluhluwe. While learning about the culture I was drawn to the beautiful beadwork and captivated by the Zulu love letter. The Zulu love letter consists of a beaded rectangular flap – which contains the message – attached to a narrow band of beads. The coloured glass beads were obtained from European traders and each colour was carefully chosen to convey a particular meaning. Positive – Purity, Virginity, Faithfulness, True Love. No negative meaning. Positive – Intense Love. Negative – Anger, heartache. Positive – Wealth, Fertility. Negative – Jealousy, withering away. DumaZulu guide giving a talk on the Zulu Love Letter. The way in which the colours are used together will either make the message positive or negative. When black and white are used together it means marriage. Red next to black means aching heart. Our guide told us that in the love letter above, of a black and red triangle on a white background, the maiden was telling her sweetheart that she loved him very much and was aching to marry him. Please could he pay the lobola to her parents of 11 cows. Blue and white means fidelity – a conventional engagement symbol. Yellow, red and black is mostly negative and means there is a fear the relationship is withering away. The main shape used in traditional Zulu beadwork is the triangle, the three corners represent Father, Mother and Child. The triangle is used to indicate gender and marital status. If the tip is pointing up it represents an unmarried girl and if it is pointing down it means an unmarried boy. A diamond shape, formed by two triangles together represents a married woman and when the two tips meet each other in the middle (hourglass shape) it represents a married man. Here are a few pictures from my visit to the DumaZulu lodge and traditional Zulu village near the Hluhluwe/iMfolozi National Park. Making beer with maize meal, malt, yeast and water. I tasted it and was surprised that it did taste just like beer. Zulu women showing their traditional pottery and baskets. It was a wonderful experience getting to know a bit more about the Zulu culture and great to see the incredible traditional arts and crafts are being kept alive. If you have anything to add to this please let me know. Have a colorful week. Go to the Phansi Museum in Esther Roberts road and see the current exhibition (until 31 August) entitled “Hear me out” by Hlengiwe Dube to find out much more in the world of colour and culture. Thank you for letting me know. Looking forward to seeing the exhibition. Have a great day.